Are you still searching for the best permanent markers for fabric that are ready to go out of the package? 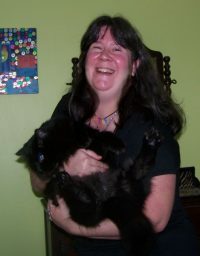 Now you can get on with what you want to do most – create! It’s not always a walk in the park to choose a good set of markers to draw on your clothes with…after all, what do they need to have first and foremost – be permanent. It can be a big disappointment to get your favorite decorated t-shirt out of the dryer one day only to discover that it’s faded – ugh! We also want beautiful, vibrant color, too, so our creativity will make a bold statement on whatever we’re drawing on. And last of all, we want a great drawing experience on the fabric of our choice, because it’s not fun to color or draw when you’re getting interrupted with skips and drags from a faulty tip. Glad to report that I’ve been on that side; having tried out iron-on transfers (way way back in the day) the kind of markers with the roller ball in them that work sometimes but sometimes not….but I’m happy to tell you that fabric markers are definitely evolving and getting better! If you’ve used the name brand before you will not be disappointed in these that are made just for coloring on clothing. 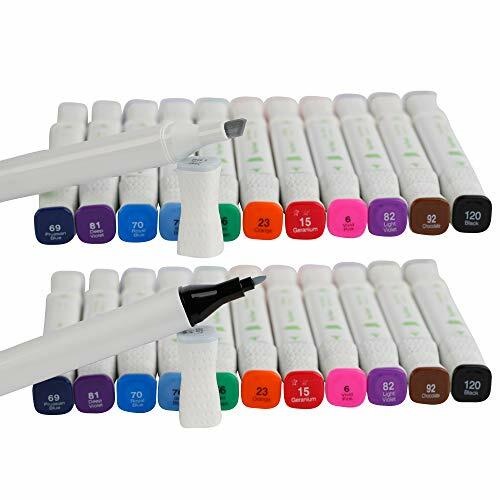 This 8 – color set of high quality fabric markers will satisfy all of your drawing and coloring needs with ease, and are water – based and non-toxic; so they are great for kids as well as us adults. The brush tip will let you have ease and control while you work, and customers reported that they don’t stink either, so if you are looking for odorless markers, they will fit the bill. With regard to marker bleed, it’s very minimal; if you hold the marker too long in one place while working or use darker colors in close proximity to one another. Cotton and canvas are the most suitable materials to use on and heat setting is not required to maintain your masterpiece. The manufacturer instructions recommend that you do wash your finished garments in cold water and hang out to dry. Cons: Some people reported that they wished there was a bigger color selection, Do not work as well on thinner fabrics (e.g. nylon), Not as good for blending colors. In summary: Excellent overall, as Sharpie is a trusted brand we are familiar with. Great for drawing on your clothing, whether or not blending colors is important to you, you can still produce some great designs. These are best as far as fabric markers for t-shirts go. as well as canvas items like sneakers, tote bags and caps. Pro Tip: In any doubt about a type of fabric? If you have some scraps or swatches around, test them out first with one of your markers to see how they will perform. 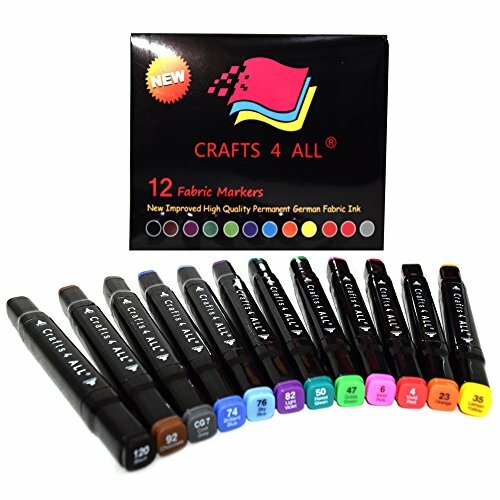 As a disclaimer I received this free to test – Crafts4All Dual Tip Permanent Fabric Marker Set with 12 Colors, and a minimal bleed variation with 20 colors. Each squarish shaped marker has a broad tip AND fine tip which is my favorite thing about them. The first set I received at discount – they came 12 to the box with fine and broad dual tips. The caps are not recessed to indicate which side is the skinny one; it’s indicated on the side. You also have to twist off the cap – don’t pull on it. Vivid Red, Orange, Pastel Yellow, Forest Green, Light Violet, Pale Purple, Sky Blue, Brilliant Blue, Grass Green, Black, Chocolate, and Cool Gray. The regular set also comes in a 36 color set (2 are black) which includes a cute black bag. Garments are machine washable and fade resistant in water temps of 30C (86F) and below. Naturally I was very excited to get started! I don’t have lots of “test” materials around, but one thing I do have is one of those drop cloths. I cut out a little square from it and proceeded to autograph it in both pen thicknesses. There was a little bleed, which is to be expected, from the first set. Drop cloths are made from a type of canvas fabric which can withstand the bleed…things like tote bags, oxford white sneakers, and perhaps denim, work great. So before I knew it, I took it one step further with a genuine artists’ canvas and did this video you can see up close – I can’t remember if I used “Pale Purple” or “Light Violet”, as the former was closer to appearing pink, even though this set didn’t have a pink per-se. The manufacturer recommends cool water temps and gentle detergents to minimize fading. Turning your garment inside out too helps, something I’ve always been sure to do first. These markers do not smear, I am happy to report. I may have gotten a little smudge here or there that was inevitable on my hands. And yes, just about all permanent markers for fabric have a distinctive aroma to them, including this set. However you won’t notice it much (Unless you are deliberately inhaling, shame on you) I think my old Sharpies are smellier. Cons: Nothing bad to report; only thing is the skinny tip end is the same size as the broad -just a nitpick though . Tulip is a very popular brand and these fabric markers tick off all the boxes – rich, vibrant colors, non-toxic, water based and fade-resistant inks, The color selection is more varied than the Sharpie set above, so you’ll have no lack of beautiful colors to choose from, as this set has 20 markers in the pack. The bullet-shaped tips are firm and will let you go to town with your imagination, thin lines, calligraphy, and coloring in small spaces can be done with ease. You don’t have to heat-set your garments either (unless you just want to, to be on the safe side) the colors are permanent when dry; you are encouraged to give your items at least 24 hours before washing for best results to prevent fading. Cons: Nothing really major to report…YMMV, though, depending on the type of fabric you want to use. I’ve used roller ball markers before (these are a good example) and in my experience you have to get used to shaking them up and getting that ball rolling, and then testing them on a scrap of fabric by gently pushing on the tips to get the paint flowing, and avoid spatters. If you wouldn’t mind doing the preparatory steps, you may enjoy this marker set. There are 15 markers in all and a couple of metallics are included; gold and silver, which there’s a high demand for. I love metallic colors, you can create some striking work with those that complement the other colors. Also, I want to point out, you do need to heat set your finished garments for best results and permanency. Cons; The roller ball thingy that you have to shake up to get the paint flowing and you are encouraged to heat-set your items later. In summary: Highly recommended, the best fabric markers for denim and dark color items. You will be able to produce some amazing work on your own. Pro Tip: Even though most of these fabric markers bleed minimally, I highly recommend you get one of those cardboard inserts (or just cut one out to size and insert into your garment. It’ll make your workflow much smoother and the fabric will lie flat easier. How can you heat set your garments? You can put the item in the dryer for 15 minutes, use an iron on a low setting, or use a blow dryer. To recap, working with slightly heavier or stiffer fabrics is best; I would not use these for silk, satin, tulle, ribbons, things like that. Although these are professional quality in terns of permanent markers for fabric go, stiffer fabrics allow the ink to “grab” better. Just had black come off our cleaning rags all over the shower walls????? thought these were permanent?? ?